MANILA, Philippines - Malacañang Palace through Proclamation No. 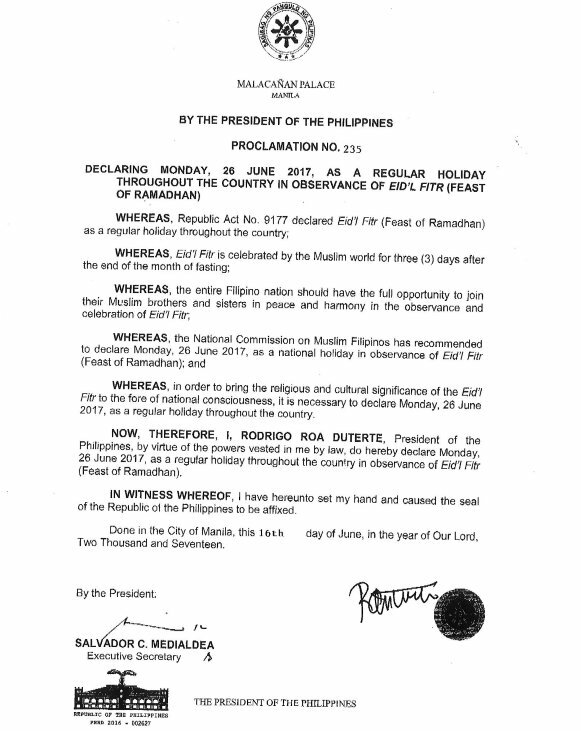 235 declared June 26, 2017 (Monday) as a regular holiday nationwide in observance of Eid'l Fitr or "Feast of Ramadan". As quoted from the proclamation, "the entire Filipino nation should have the full opportunity to join their Muslim brothers and sisters in peace and harmony in the observance of Eid'l Fitr". That in order to bring religious and cultural significance as well as national consciousness on the occassion, it is necessary to declare June 26, 2017 as a regular holiday throughout the country, as recommended by the National Commission of Muslim Filipinos. Eid'l Fitr or "Pagtatapos ng Pag-aayuno" is a national holiday that commemorates the end of Islamic holy month of fasting. Though Philippines is a Christian country in general, the date has been imposed as national holiday through RA 9177 since 2002 in respect to the country's Muslim community. Republic Act (RA) 9177 is an "Act declaring the first day of Shawwal, the 10th month of the Islamic Calendar, a national holiday for the observance of Eidul Fitr and the 10th day of Zhuld Hijja, the 12th month of the Islamic Calendar, a regional holiday in the autonomous Region in Muslim Mindanao for the observance of Eidul Adha"
The celebration of Eid'l Fitr depends in the lunar calendar (moon-sighting). The National Commission of Muslim Filipinos (NCMF) is the commission in charge to inform the Office of the President on which date it will fall. It will be a long weekend next week considering that Eid'l Fitr for 2017 will fall on Monday.